There are some people who see asking for help as akin to admitting weakness. However, suffering in silence just leads to shoddy work and missed deadlines. Don’t be afraid to reach out for assistance! For help on how to ask for help, check out our tips below. When you get bogged down with a project, you can miss obvious solutions. Take a breath, take a break and come back to it with a clearer mind. With a fresh perspective, you’ll truly know if you can tackle it on your own, or if you need assistance. Additionally, don’t forget how wonderfully useful Google can be. From Excel tips to writing inspiration, there is a chance that what you need is available on the World Wide Web. However, be careful not to spend so much time searching for information that you end up falling behind on the project! While it’s important not to hand work off unnecessarily, it is also important not to ask colleagues to help you scramble towards a deadline. No one wants to give their time to someone who can’t manage their own. Asking for help earlier in the process usually results in less extra work for everyone. People often avoid asking for help because they fear seeming incompetent. When you approach your colleague, let him know what you have done so far and the different avenues you are thinking of pursuing. This gives him some direction and makes it clear that you don’t expect him to do your work for you. A vague request is nobody’s friend. Let your colleague know what exactly you need and how much time you think it will take. For example, “John, can I get fifteen minutes of your time? I need help formatting the graphs in this presentation,” is much clearer than “John, can you help me with this?” In this way, you will not be seen as burdening your colleague, because he is aware of what helping you entails. After making this commitment, keep to it. Don’t try and slip in additional requests. Whether it’s a sincere thank you, a shout-out to your boss or a plate of home-made cookies, make sure to show your appreciation for your colleague. It’s the right thing to do and will make people more likely to help you in the future. And of course, when someone asks you for help, always try and return the favor. When working as part of an organization, it’s only natural to have to rely on one another. 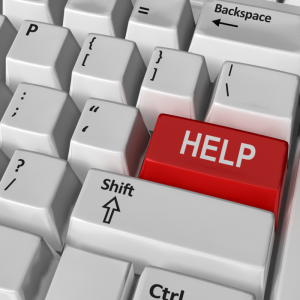 Do you have difficulty asking for help at work? How do you go about it? Let us know in the comments! This entry was posted in Clients, Currently Employed and tagged Asking for Help at Work, help at work, Teamwork. Bookmark the permalink.